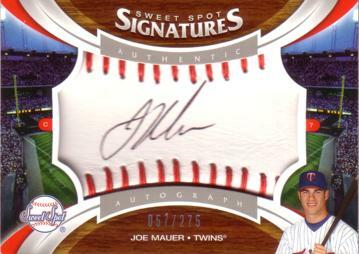 Joe Mauer may single-handedly force me to order the MLB Extra Innings package if he keeps hitting like this. The Twins catcher is on one of the all-time great hitting tears I’ve ever seen — certainly among players belonging to my favorite baseball team — and sadly I’ve missed much of it so far. Of course, one of the crosses to bear of being a Twins fan, or of any other small-market baseball franchise for that matter, is that any time a player on your team enters the conversation among the best players in the game, it comes complete with speculation about which Country Club franchise that player will end up with once he hits the open market as a free agent (see Santana, Johan). Indeed, there was already no shortage of Yankees, Red Sox and other teams’ fan forums and bloggers licking their chops over Mauer’s impending free agency following the 2010 season, and that speculation has increased dramatically now that Joe has added home-run power to his great batting average and exceptional defense. Remember, this is a guy who is the only catcher in the history of the American League to win a batting championship, and he’s already done it twice at the young age of 26. But as far as Yankees, Red Sox, Mets, Cubs and Dodgers fans are concerned, speculate all you want — you can’t have Mauer. The sooner you all accept this reality and move on, the easier it will be. He will never hit that free-agent market. Here’s a prediction for you: Joe Mauer will someday be elected to the Baseball Hall of Fame, and when he does he will be wearing the hat of the Minnesota Twins — the only Major League team he’ll have ever played for. Yeah the Twins are scrooges, and they have time and again let their fans down by failing to lock up popular, star players in time to stave off their free agencies (see Hunter, Torii), thereby being forced to either let them walk away for nothing or trade them for whatever they can get (see Viola, Frank). But mark my words, Mauer will be different. Twins fans are still smarting over Santana’s departure two winters ago. It’s very difficult to accept the fact that my team traded away the best pitcher in baseball, and possibly a future Hall of Famer himself, in the sweet spot of his prime. The fact the Twins seemingly didn’t get much value in return only makes it sting worse. Twins fans had trouble accepting that both Johan and Torii were lost in the same offseason, but the truth of the matter is the team’s brass was looking a few years down the road in letting them leave. Because there’s no way the Twins could have afforded to have big fat contracts for Santana, Hunter, Mauer and former AL MVP Justin Morneau on the books all at the same time. They chose, presumably, to focus on the latter two components of that equation. The Twins are penny-pinchers, make no mistake, but they’ve also shown in the past that they will occasionally spend the dough on their cornerstone players. In this case, there were just too many cornerstone players to accommodate at once, so priorities had to be set (Wow, I can’t believe I’m actually sticking up for Twins GM Bill Smith). Remember, Kirby Puckett became the first $3-million man when the Twins gave him a three-year deal for $9 million in 1989. At the time, it was the richest contract in baseball history. The Twins recognized that Puckett was an extremely valuable commodity who was worth the investment, and they did what they needed to do. As popular as Puckett was in his day — the most popular Twins player in Minnesota in my lifetime — Mauer is more popular still. One of my favorite Twin Cities radio personalities, KFAN’s Dan Barreiro, long ago labeled Mauer “The Baby Jesus,” because the man can seemingly do no wrong in the eyes of most Twins fans and Minnesota media members. He is “One of Us,” born and raised in St. Paul, taken with the first overall pick in the draft of 2001, and he was already on the radar of Minnesota sports fans while winning high school state championships in baseball, football and basketball at Cretin-Derham Hall long before the average guy in the rest of the baseball universe knew who he was. There are only two scenarios I envision where Mauer ever hits the open market. One, the Twins upset him by trying to low-ball him when negotiations begin on his next contract extension, and I don’t believe that will happen. The other possibility is that, having lived in Minnesota his entire life, Mauer decides he actually wants to sample life in the spotlight of New York, Boston, Chicago or Los Angeles. But it’s hard for me to imagine the seemingly humble Mauer, with his “Aw, Shucks” persona, yearning for that kind of attention. Because I don’t think money is going to be the driving force for Mauer. That’s not to say he’s going to sign for nothing, all for the love of playing in his home state. But I believe that he would accept less money than the market might bear to stay home, close to his tight-knit, baseball-loving family, and continue playing with his buddy Morneau. Oh yes, don’t underestimate the deep friendship between the Twins’ top two sluggers. The two of them shared a bachelor pad in their younger days with the Twins, and Mauer stood up as a groomsman in Morneau’s wedding this past winter. That friendship doesn’t guarantee anything, but if the two wish to continue playing together for the same team — and I believe they do — it would obviously be far easier to do so by staying put. Morneau is already locked up long-term, and the word around the Cities is he is an active lobbyist in convincing Mauer to do the same. In addition to being the best catcher in baseball — and if he continues to hit at anything close to his current clip, one of the best hitters in the game, period — Mauer, with his GQ good looks, has made baseball fans and Twins fans out of thousands of women who would not otherwise have embraced the team. Let’s acknowledge a reality here: While there are legions of women in this world who love baseball and sports for the competitive aspect and the game itself, there’s also plenty of women who enjoy sports simply because they enjoy watching good-looking, athletically-built, genetically-blessed and extraordinarily wealthy young men. 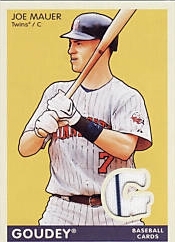 And Joe Mauer is a lot of all those things (so is Morneau, for that matter). In every way a pro athlete can be marketable and valuable to his team, Mauer is close to the ideal. So with (insincere) apologies to the blue-blooded fans of all of baseball’s power élite teams, time to move on to the next man crush. Minnesota’s version of the M&M Boys are going nowhere. I hope you’re right. I sincerely and utterly hope you are right. Nothing would make me happier. “I can’t believe I quoted Sid Hartman, I feel Dirty”…….thats good stuff right there.